PATNA, India -- The Archaeological Survey of India (ASI) has started excavation work at Ghorakatora mound near Giriyak — located between Biharsharif and Nawada on NH-31 — in Nalanda district to find the main gateway to the ancient Nalanda Mahavihara. The contour map has been prepared and camp pitching work started last week. Archaeologists feel that the excavation would throw fresh light on the existing ancient Nalanda site. ASI superintending archaeologist ASI, Patna Circle, P K Mishra told TOI: "Excavation of this site is essential as it may reveal some hidden glorious past of this site. 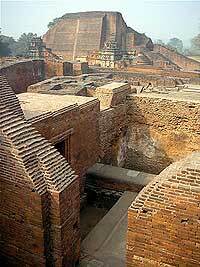 It may also prove to be a bigger structural site than the Nalanda Mahavihara, after excavation." It is centrally protected mound under ASI, Patna Circle, Patna. Keeping this in view, ASI excavation branch (Patna) has decided to excavate the site, Mishra said. "The excavation at Ghorakatora mound will be taken up in grid pattern and it will be a horizontal excavation," he added. Besides discovering the main entrance gate, the excavation is likely to throw more light on the dating of Lord Buddha, the place of Buddha's relics buried somewhere near Rajgir and antiquities of pre-Buddha period, Mishra said. It is a massive mound measuring about 900 metre (north-south) x 500 metre (east-west) x 40 to 50 feet in height, first noticed by Francis Buchanan. There is a tomb of Hasan-Hussain at the northern portion of the mound, according to local residents. At the centre of the mound was a small square fort with bastion at the four corners. The ceramic found there is red ware, black slipped ware, northern black polished ware and black and red ware potsherds. Some antiquities have also been collected such as terracotta beads and a fragment of Sunga plaque. It indicates that site may date back to chalcolithic culture leading to northern black polished ware culture, Sunga-Kushana times up to mediaeval period. The burnt-brick structures were running west to east exposed at the western periphery of the eroded mound due to weathering. Many terracotta ring-wells have also been noticed. It seems to be a structural site and might be connected with the ruins of Nalanda Mahavihara, said an archaeologist. The river Panchana, which flows west of the site, also connects with motorable road leading to Tapovan, Jethian and Rajgriha.